I found a way to speed up the data import in hybris. The approach explained below will allow you to import data two times faster than the regular Impex does. Video of PoC, some numbers, and technical details are below. are also in this category, because Spring Integration and Import Cockpit convert CSVs to IMPEXes. hybris API (modelService). This approach is to create your own importers with the custom logic. Perhaps, in hybris 6.0 SAP introduced ServiceLayer Direct as a projected replacement for the legacy JALO layer. However, the new engine has not become the default engine in 6.0/6.1 due to the amount of crucial legacy business logic working only with Jalo. I leveraged some of its components to work with the objects which meet the criteria of new engine compatibility. Such objects as StockLevel and PriceRow are common key players in the integration process. If your prices or availability data are regional-specific or store-specific, the amount of data could become really massive. First two operations (Locating and Loading) use the cached data if there are any (region cache). 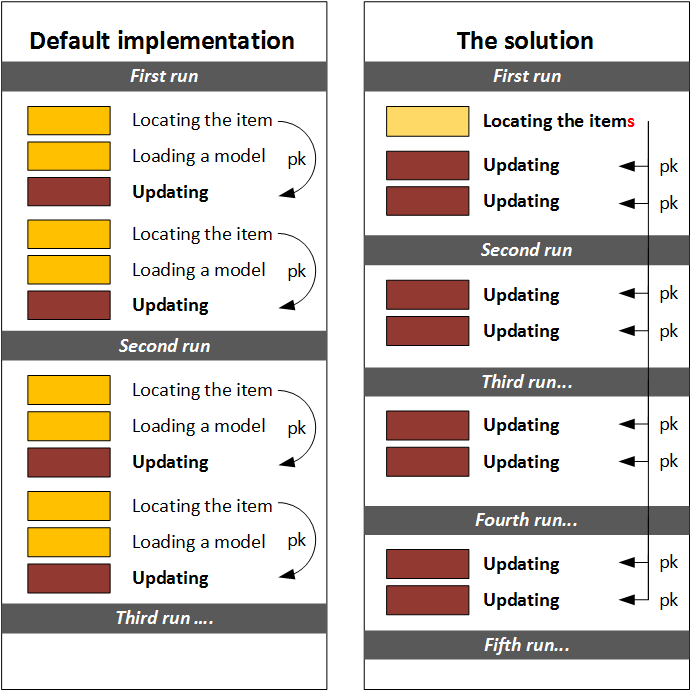 However, it doesn’t solve the problem completely: if you have millions of the items to change, 2/3 of your operations will take precious time, memory and CPU resources. The idea of the solution is to get rid of the first two requests and use the pre-build memory lookup tables instead. 16 threads 50000 17,1 sec 7.5 sec two times faster! 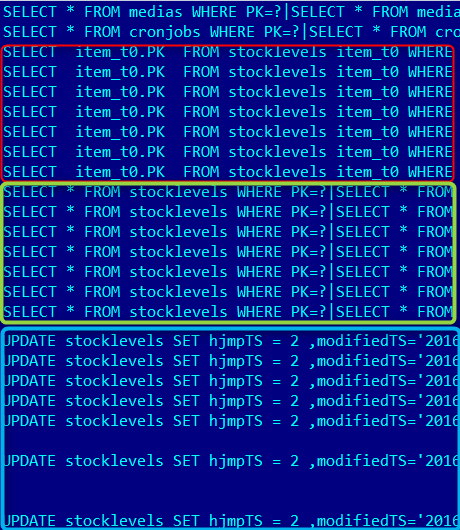 There are all three components marked by color (Lookup, Loading model, Updating) There is only one component, an Update statement. Multithreading is not implemented in hybris classes. You need to manage it by yourself. There are three objects, UpdateRecord, InsertRecord and DeleteRecord. The example below is about UpdateRecord, all others are used in the similar way. I used StockLevel as an example, you can change it to other objects. There are some limitations, see the next section for the details. Item attribute is configured as Jalo in items.xml. It means there is a business logic in a Jalo class (Item or Manager) for a getter or setter. You lose all flexibility that the regular impex import has. If you need to reference to any other objects (like warehouses), you need to perform additional requests to build a map (WarehouseId -> PK). You need to write more code and test it thoroughly. Hey Rauf, there is a third option: we integrated into hybris Sping Batch which relies on the plain data source and can process information in transaction frames for example by 100 object at once. Also it provides wide capabilities to create a complicated sequence of step for handling which full of control when something goes wrong. The last thing was nice especially if you spent much time with explaining to custom how they should read errors after ImpEx. Thank you! Good comment. I will find time to investigate it. For the first part of your message, regarding spring batch, were you creating our updating data? For the update, you will have three requests any way, because it’s a way how hybris persistence works.